Is Ours a Christian Civilization? 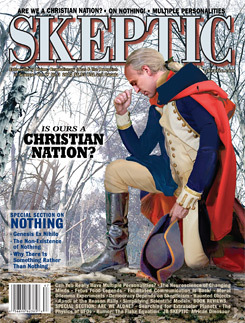 by Tim Callahan Cover photo: George Washington’s legendary prayer at Valley Forge—updated. Art by Pat Linse. Thanks to Eduard Pastor, Gingi Yee, and David Patton for help with photo reference. How Realistic is it for Spacecraft to Travel Interstellar Distances to Earth? Written by Daniel Loxton. Cover by Daniel Loxton and Jim WW Smith. What’s it Like to be a Brain? A review of Consciousness: Confessions of a Romantic Reductionist, by Christof Koch.